The big challenge in printing is that so many independent departments are so closely linked together in the production flow of a printed product in the commercial-, magazine-, label-, folding-carton- and corrugated printing industries. 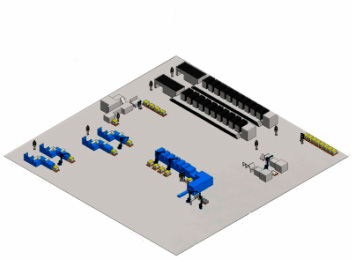 An additional challenge is that even though all machines in the print production flow are highly automated, feeding and emptying of the majority of these machines are, especially in the finishing departments, done manually. Apart from the very demanding psychical workload put on the operators, this production concept also limits the capacity of each individual machine to the operators’ psychical working capacities. It is, in other words, basically impossible to improve the productivity of each specific operator, and an increased production capacity can only be obtained by adding more operators to a specific machine. In a community, which constantly procures increases in productivity this is not a very intelligent or profitable approach. The solution is to automate the demanding feeding and emptying of the sophisticated machines with increased automation and the use of robots. In this way the highly productive machines can be used to their utmost, and the operators can focus on performing tasks, where the highly professional skills can be used in the optimal way – while the operators suddenly also turn into being much more productive. 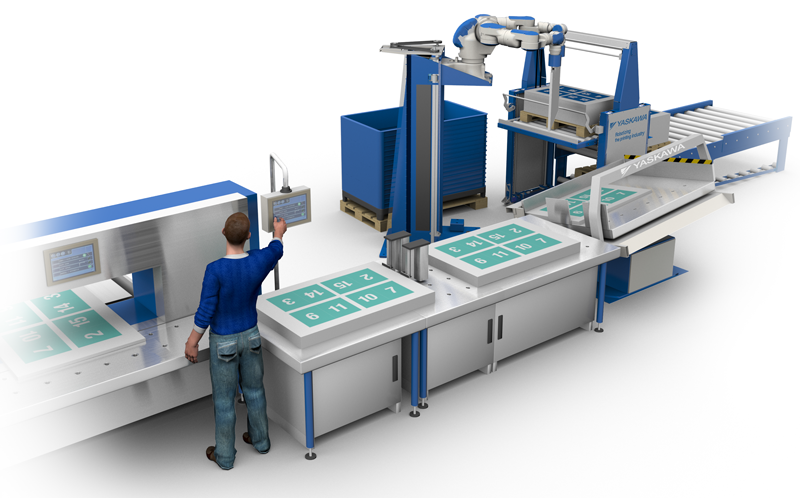 Yaskawa’s solutions for each specific department can of course also be linked together, so a total overview of the robotized workflow can be obtained.